Experience your games with totally immersive, life-like action. 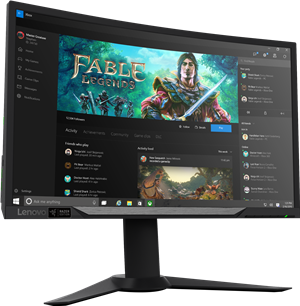 The Lenovo Y27f monitor gives you 27" of wide-angle viewing on a unique R1800 curved panel that's optimized for gaming – the most extreme curve available today! AMD FreeSync technology with fast 144 Hz refresh rate eliminates screen tearing, and minimizes display stutter and input lag. This is one display that's sure to up your game! dimensions 22.2" x 24.6" x 9.5"
Experience your games with totally immersive, life-like action. The Lenovo™ Y27f Curved Gaming Monitor gives you 27" of wide-angle viewing on a unique R1800 curved panel that’s optimized for gaming – the most extreme curve available today! This is one display that’s sure to up your game!